In recent years, we have seen great success with our patients with minor misalignment issues who have chosen Invisalign as an alternative to traditional metal braces. Invisalign works in a similar way, but provides more subtlety and discretion for patients who don’t like the way metal braces look. 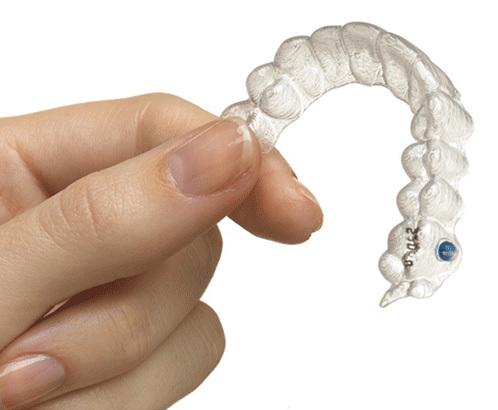 Invisalign is a set of see-through custom-fit aligners that can be placed directly over your teeth. These clear plastic aligners are worn about 20 hours each day and can be easily removed and replaced. Every few weeks, you will visit your orthodontist so that he can give you a new set of custom-fit Invisalign aligners. The aligners change with your teeth until you obtain that perfectly straight smile. Here at McMillen Orthodontics, we know that many adults prefer to keep their orthodontic work as subtle as possible, but we have also serviced many teens who feel the same way. Many individuals who wear braces do so during their teen years, but these years are not the ideal time for an altered appearance. Teens love that Invisalign is discreet. It does not affect their appearance, but still works wonderfully to get them the straight smile that they want. More Confidence | For adults and teens, Invisalign is the subtle alternative to metal braces. Your appearance will remain the same while your teeth are shifting and straightening. No one needs to know that you are wearing braces. Increased Comfort | The plastic that Invisalign is made of is smooth, so it does not rub uncomfortably against your lips and mouth. The custom-fit aligners fit your teeth perfectly. You will hardly know they are on your teeth. Lower Maintenance | Invisalign is removable, so there is no need to change your oral maintenance habits. You can brush and floss normally instead of buying special floss for braces and brushing around brackets. Call us at McMillen Orthodontics today to get started on your subtle and comfortable journey to the straight teeth that you want.